Sweet potatoes have become a staple in the Paleo diet in recent years. Move beyond the basic “baked or fries” with these easy, family-friendly and delicious sweet potato recipes. Sweet potatoes are a nutrient-dense root vegetable. They’re high in fiber, vitamin A, and a good source vitamins B5 and B6. There are several different varieties of sweet potatoes available. Feel free to use yams, ube or any other variety in the sweet potato recipes below. Try this melt-in-your-mouth delicious spin on traditional banana muffins. Omit the optional pecans or walnuts and use arrowroot flour and sunflower seed butter for a nut-free recipe. Note: sunflower seed butter may given the muffins a greenish tint! Preheat your oven to 350 °F. Line a mini-muffin tin with paper liners or grease with oil. In a medium bowl, whisk together the coconut flour, arrowroot flour, cinnamon, baking soda and salt. Set aside. In a sauce pan, combine and melt maple syrup, coconut oil, sunflower seed butter over medium heat. Remove from heat and slightly cool. Add the sweet potato, banana, eggs, coconut oil, sunflower seed butter, and maple syrup to the dry ingredients and stir to combine. Divide the batter evenly, filling each muffin well. Bake for 15 minutes. If making regular sized muffins, bake for 22-25 minutes or until an inserted toothpick comes out clean. Remove from oven and transfer muffins out of pan and on to wire rack to cool. Sweet potatoes stand in for beans in this hearty chili and are a nice compliment to the smoky chipotle pepper. It’s great served with diced avocado, fresh cilantro and lime wedge. Heat oil in medium saucepan set over medium-high heat. When oil starts to shimmer, add ground turkey. Break up turkey with a wooden spoon and cook 5 minutes. Add onions and garlic and continue to cook an additional 8-10 minutes or until onions are translucent and meat is almost cooked through. Turn up the heat to high. Add tomatoes, sweet potatoes, broth and seasonings and bring to a boil. Reduce heat to medium-low and simmer uncovered 10-15 minutes until chili is hot and sweet potatoes are tender. A longer simmer will intensify the flavors and leftovers are even better the next day. The flavors of fall will burst in your mouth with these delicious waffles. These waffles make for a perfect freezer-friendly recipe. To reheat, simply take out of the freezer and pop in the toaster or heat in the oven at 300 degrees for 5-8 minutes. Blend all of the ingredients in a blender or food processor. Pour batter onto waffle iron and let cook for 4­-6 minutes or until golden brown. Cooking time will depend on size of waffle iron. Top waffles with pure maple syrup and pecans if desired. A one-dish wonder! A simple recipe that tastes delicious, is perfect for leftovers, and makes for a quick kitchen clean-up. Cover with foil and bake for 40 minutes. Remove foil and bake for an additional 10-15 minutes or until chicken is no longer pink and sweet potatoes are soft. This bursting-with-flavor sweet potato hash is similar to the hash found in the Simply Nourished: Winter book that has received rave reviews – but this one has an awesome Tex Mex twist. A great way to use up any leftover taco meat that might be kicking around in your fridge or freezer. Place a sauté pan over medium-high heat. Add beef, seasonings and water to the pan. Cooked until beef is browned. Remove beef from pan and place on paper towel lined plate. To the same pan, add ½ Tbsp. of coconut oil and heat over medium-high until it starts to shimmer. Add sweet potatoes, dash with salt and pepper, and sauté for about 10-12 minutes or until cooked through and slightly browned. 5. Add remaining ½ Tbsp. of oil, onions, red pepper, mushroom and spinach and sauté for about 3-4 minutes or until vegetables are tender. Garnish with fresh cilantro. Sweet potatoes and roasted red peppers create an creamy texture, while the paprika and chili powder spice up this spread. Preheat oven to 425°F. Wash, peel and cube sweet potato. Season sweet potato cubes with paprika, chili powder, salt and pepper to taste. Roast until soft, about 30 minutes. Allow sweet potatoes to cool for 10 minutes. Once cooled, add to a food processor or strong blender sweet potatoes, red peppers, tahini, olive oil, lemon juice and additional seasonings to taste. Puree until smooth. Add small amounts of water to thin out hummus, if necessary. Serve with fruit and veggie slices or spread on a Paleo sandwich. Store leftovers in fridge for up to four days. Enjoy! The perfect dish to serve at parties or on game day! Preheat oven to 400°F and lightly grease a baking sheet with coconut oil. While the sweet potatoes are cooling lower the oven temperature to 350°F. Lay bacon slices on a baking sheet and bake for 15-20 minutes or until they reach desired doneness. Remove from the oven and lay on a paper towel to cool. Remove from oven and allow to cool for 5 minutes. Crumble bacon slices on top of the potato skins, sprinkle with chopped green onions, and scoop a spoonful of guacamole on top. 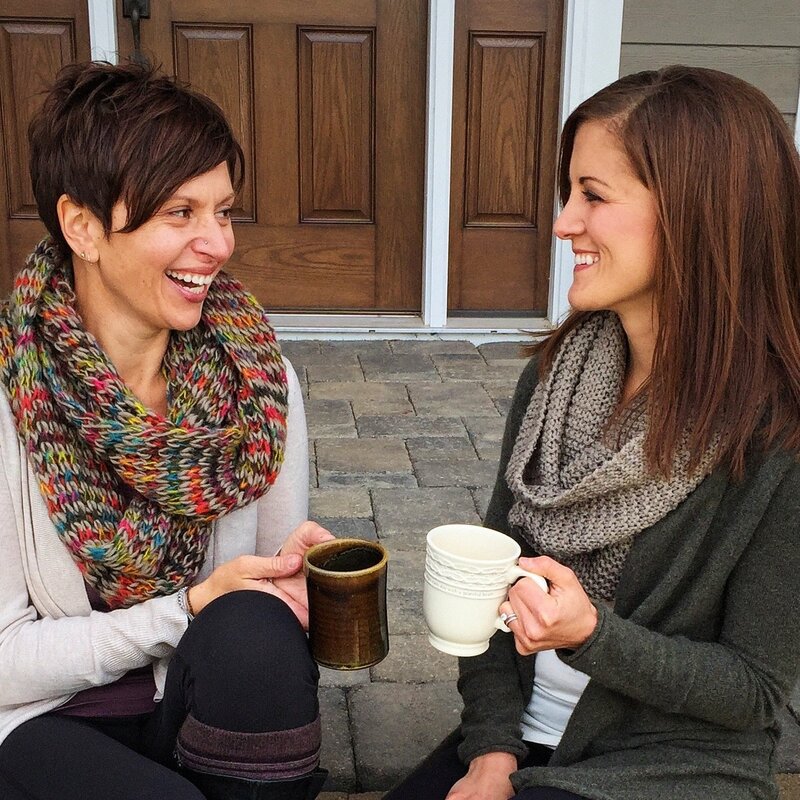 Stacie Hassing and Jessica Beacom are the Registered Dietitian Nutritionists behind The Real Food Dietitians website and blog. They create gluten-free and Paleo-friendly recipes that are designed to be big on taste and short on ingredients, so you can spend less time in the kitchen and more time doing what you love. You can find more recipes as well as nutrition, health tips and meal planning tips on their blog at The Real Food Dietitians. For more posts by The Real Food Dietitians, click here.